Imagine watching a Hollywood blockbuster and suddenly realizing that — although you weren't mentioned in the credits, much less paid — you wrote its plot and created its characters. Its actors look exactly like those men and women you dreamed up, right down to their hairstyles and the shapes of their chins. That's what happened to Steve Englehart. At Emeryville's AMC Theatre, he sat down to watch The Dark Knight — and got the shock of his life. 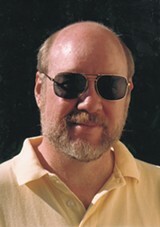 As the longtime lead writer for DC Comics, which is owned by Warner Bros., Englehart had revamped the company's Batman and Superman series, among others. The 1989 Batman film starring Michael Keaton was based on Englehart's work; during production, Englehart was hired to assist. After the 2005 release of Batman Begins, DC asked Englehart to write twelve more comic books featuring the caped crusader. He did — but then Marshall Rogers, the popular artist who had illustrated Englehart's Batman books for years, died suddenly of a heart attack after completing the seventh. "When Marshall died, it was a big deal in comic-book fandom," said Englehart. "I was getting calls from The New York Times, the Los Angeles Times, Time magazine. Everyone wanted to know what I was going to do with my unfinished series." Other artists clamored to fill Rogers' shoes. Through the grapevine, Englehart learned to his surprise that DC was going to chuck the series — and, in so doing, chuck him. "I thought: What the hell? How stupid of them; how bitchy — but not totally out of character." Never to appear in book form, his last few Batman manuscripts became DC property, which also was Warner Bros. property. Flash forward to that day in Emeryville. "I thought: There it is! There's my unpublished story, on the screen." Although he estimates that 70 percent of The Dark Knight is based on his series, The Dark Detective, Englehart decided not to sue: Too many other writers had tried and failed. Because mainstream comic books are created on a work-for-hire basis, "we signed away our rights to what we wrote," said the Oakland author, who will be at Moe's Books (2476 Telegraph Ave., Berkeley) on Wednesday, March 31. Englehart, who has also written for the gaming industry, is now penning a series of novels featuring Max August, an immortal "alchemist with a gun" who served in the Vietnam War and stopped aging in 1985. In his latest, The Long Man, Max uses magic to defend a hot neuroscientist against an evil cabal.